Lynndale Park is a 1:4,000-scale map with a lot happening in it. You’ll find rolling hills, runnable forest, and a complex trail network bounded by open areas with buildings. This is where the school league training is held each fall. The trail network here earns this park its “5” rating for navigation. A plethora of intersections and curving, twisting trails can have you checking your compass, retracing your steps, or at the very least triple-checking your surroundings when deep in the woods. Especially when we have a Night-O event here! This park has one large hill that covers the entire width of the park, but other than that, this is gently rolling terrain. 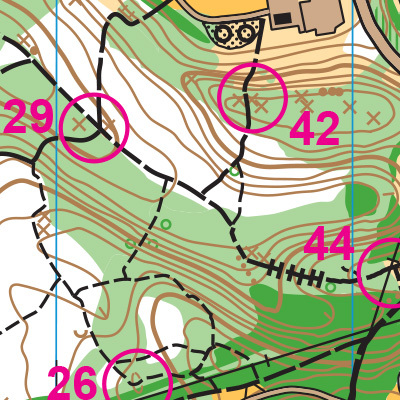 Footing is generally quite good, except on some of the steeper trails at the north end. Take I-405 N to Lynnwood.